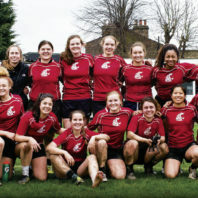 The Washington State University women’s rugby players returned from their historic March trip to London with some bumps and bruises, but it’s the memories of competing against some of the world’s best club teams, seeing famous landmarks, and building camaraderie that they’ll remember the most. One day in 1948 four Washington State College students tugged on their white rubber swim caps, adjusted their nose plugs, and plunged into a cold swimming pool. Three of them locked together head to foot to form a vertical underwater ring, and the fourth swam through it toward a photographer who captured the maneuver on film. Back in the late 1960s, when Jo Washburn was athletic director for women’s intramural sports at Washington State University, she had to stretch $1,200 to cover all the expenses of the volleyball, gymnastics, basketball, field hockey, skiing, and tennis teams. Women’s athletics was a second-class affair. The athletes had to carpool to away games and sleep four to a hotel room to save money. They had to buy their own uniforms. They helped set up spectator seating for their meets. And they trained only when the facilities weren’t being used by the men’s teams. Few, if any, received athletic scholarships.